A great message, Cheryl. It seems timely for us in God's family as so many teachers of God's Word instruct us to trust God because transition is on it's way. Thank you for sharing your personal story with us and the great song too. My favorite line: With God, all things are relevant. Everything is connected and makes sense. There are no wasted moves. "And we know that all things work together for good to them that love God, to them who are the called according to His purpose." Loving hugs to you on this first of May! Thank you ever so much, sweet friend! Your dear words of encouragement are so precious to me. Sending love, hugs, and gratitude to you! By the way, I've never played that game, lol. What a beautiful story of how God brought events together to fulfill His purposes in your life! Isn't He amazing the way that He works? I just spoke about that with another friend today: God's ways are not like our ways, but His ways are best! You are so right that there are no wasted moves when we walk with God. Congratulations on your soon to be 29th Wedding Anniversary! Blessings and Hugs to you! YES, dear Bettie, it surely is amazing how God works! We don't always see it at the time, but later, He makes all things clear. Thank you for your dear, kind words of encouragement...you are such a sweet blessing to me! Sending love and hugs to you!! Such a beautiful post and it's true, we have to step out in faith and do things as He wills, not us. We're going to be facing big changes in the next few years and have been praying for God's hand to lead us. I've given up playing these computer games. The computer always wins. However, it has never beaten me at kick-boxing. I have sent many a computer, tablet and smart-phone back to its maker!!! They're not so smart when in a million pieces!!! Indeed, God directs us in paths that we never envisaged when we started on our journey. What a beautiful story of looking back and being able to trace God's hand! Oh, I just loved reading this and thank you so much for sharing! I am in awe of our dear Lord, too...and I love what you said about Him not being limited by time or space and how He releases time into our circumstances as He sees fit. I should trust Him more...I should be so convinced of this truth that I never worry again. Thank you for your dear, encouraging and edifying words. I love and appreciate you so much, sweet friend. Such a beautiful post with a powerful message, my friend. I so appreciate you and the wisdom you share...thank you! Thinking of you, dear one, and sending love your way! And, I so appreciate you stopping by and leaving such precious words of encouragement, dear friend. You are such a blessing to me. Sending much love and gratitude and many hugs your way today!!! Well, it sounds like quite a few have never played, so you are in good company! :) That is so true about the unseen being more powerful than what we can see and understand! I love that! I am so thankful for your sweet visit and kind words. Sending love and hugs to you, sweet friend! Your posts are always so inspiring dear Cheryl! It is so true what you have written, our Lord makes no mistakes, even if we can't comprehend His moves, He has a plan! I've never played Candy Crush but I've heard it is a lot of fun to play. Isn't it wonderful when the Lord gives you insights into life from simple experiences you are involved in! I enjoyed hearing about how the Lord rearranged the situation in your life to allow for you to meet Kevin! I know He did the same for my husband and I too! Such amazing goodness of the Lord, and how He orchestrates events that seem to have no meaning or connection, and yet years later we can look back and see His hand of design on our lives even in the moments that made no sense! Such a beautiful and amazing post you have shared today, appreciate your friendship so much, and praying the Lord's sweetest blessings on your life today! Oh, dear friend, thank you! I so appreciate your precious words and encouragement today....it just means so much to me! I am surely so grateful for your dear friendship, too, and trust the dear Lord to bless and be with you always. I am praying often for you and sending much love to you today! Dear Cindy! How I appreciate you and your precious, kind words! I cannot thank you enough for stopping by, reading, and leaving such loving support. Sending much love and many hugs your way!! Thank you ever so much, sweet friend! Your dear words and smiling face are always such a bright spot in my day. I am ever so grateful for your support, encouragement, and friendship. May the dear Lord bless you! Sending love and hugs your way! Wonderful story of the hand of God and the hearts of your and Kevin! I was also struck of how our wasted, wrong moves, are still able to be used by the sovereign hand of our Father. So thankful for that love and grace. Good to hear from you and your thankful heart, sister. Thank you so much, brother! I love what you brought out about how our wasted, wrong moves are still able to be used by our Father. Wonderful, comforting thought! May He bless you abundantly for the encouragement you are to me and others. I so appreciate your visit and kind words! You are so right - when we follow God's lead (instead of what we think we should do), there are no wasted moves! Visiting from Messes to Messages. Thank you so much, Laura! It was just such a dear blessing to have you visit and leave such sweet encouragement. God bless you, my friend! It's lovely what a game can teach us about the lessons in life. This is lovely. A beautiful reminder that God has no wasted move or plan in our lives. Everything is calculated. Everything brings us to our ultimate and eternal purpose. Thank you, Regine...all glory be to Jesus. God bless you! Cheryl, Thank you so much for your insight and wisdom here which brought me such encouragement. Even though I am busy, busy, busy and spend three precious days a week with my granddaughter, I am navigating through one of the loneliest times of my life when it comes to female fellowship. My husband has heard me say often, "I am almost 57 years old and I feel like I am wasting my life away rather than living it." You have given me hope that in this season I find myself in, God is not wasting it and will indeed redeem it. I appreciate you so much. You are such a dear friend to me, and I think of and pray for you often. And thank you for the Candy Crush tip! I never do the suggested move because of the reasons you stated, but I am going to have to try that now! lol. Oh, dear friend! Your words are just precious to me and always so encouraging and uplifting. I cannot thank you enough. I appreciate you so much, and you are surely a dear friend to me, too. You will NEVER know how much I appreciate your prayers...I need them so much! God bless you over and over again...I love and appreciate you dearly. Thank you for this encouragement! God doesn't waste anything, even the hard times are used for His glory and our growth. This is a wonderful testament to the way God has moved in your life, Cheryl. You are so right-so often those "little moves" that seem meaningless have a huge impact in our lives-something that we never dreamed would happen. ps. Just realized you are not on my sidebar -and I read from there. Off to fix that right now while I am thinking about it. Oh, how sweet you are, dear friend! It just means the world to me that you are adding me to your sidebar! What a dear you are! Your kind, encouragement here is precious to me, and I am so grateful for our email correspondence, too. SO very thankful for your dear presence in my life. Sending much love to you and trusting God to bless you abundantly! Praying for Kristen.. My heart hurts for her and her family.. I know this has to be the longest/darkest time of their lives. God is there.. He never leaves us nor forsakes us.. Praying God give them strength and understanding. Praying for health of Kristen and her sweet baby who is definitely a fighter. Wasted time... love your post. So true. Oh, Judy! You are a precious, kind soul! I am SO grateful for your continued prayers for my dear niece...they are SO needed and appreciated. Her delivery is drawing ever closer, so, obviously, there is a lot of battles with fear over what is ahead. GOD is our refuge and strength, and we rely solely upon Him to see her and her baby boy through this with health and life. GOD BLESS YOU for being so faithful to pray for them, even when I don't ask. Oh, my, you just have no idea what it means to me and all of us. Love you so much, sweet friend. Hi Cheryl! I remember reading that God writes straight with crooked lines, and that thought came to me as you wrote about the way you met your husband. We just don't have any idea what God has in mind, and yet we are on his road the whole time. I have played Candy Crush, and I know exactly what you are talking about. 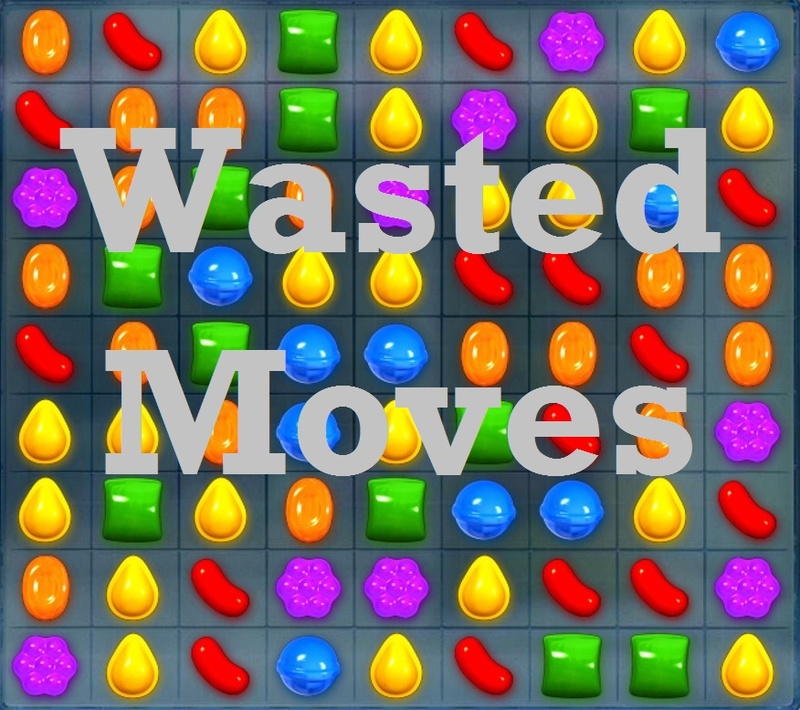 Even 'wasted moves' can be filled with forward movement! It's a great thing that we are being led (whether we know it or not) by the wisest, most loving Father of all. Wow, I love that about God writing straight with crooked lines. That is an amazing thought! Thank you ever so much for continuing to pray for Kristen. I just included you in an email I just sent out. You will never know how much I appreciate your love and prayers and friendship. May God bless you, my friend! I'm glad to see from the other comments that I am not the only one who hasn't played Candy Crush! I have seen people play it though so I understand what you mean and it is a great illustration. I love this: "What looked like a wasted move turns out to be the very thing needed to propel to victory." It is often difficult to see what God is doing in a situation or why he is leading us in a certain direction, but later it often makes more sense and we see what he is doing. Thanks for this encouragement to trust God even when things do seem like a bit of a puzzle. Oh, bless your heart! It is a fun game, but quite frustrating, at times! Just like life, I suppose. Thank you ever so much for your visit and kind words! They mean so much to me. :) May God bless you abundantly, my friend! This is one of the most insightful and beautiful pieces you've published. I felt so encouraged. I haven't played Candy Crush. If you hadn't included the picture, I'd not have had any idea. ~smile~ Thank you for being my friend. Oh, thank you, sweet friend! I am so grateful to you for your encouragement, love, support, and friendship. Sending much love and many prayers your way!! Such wise words you have written, my friend. Although I have never played Candy Crush, I understand what you are saying about "wasted moves." Thank you for the reminder that we can trust God with all our moves---even (and especially) with the ones that don't seem to make sense. He sees the big picture; we don't. Thank you ever so much, dear friend! I am so grateful for your sweet visit and kind words. It is a blessing to walk this blogging journey with you! Sending love and hugs your way! What a beautifully written post, Cheryl. I'm so glad that you followed God's lead and met your dear Kevin. Thank you for sharing this, as an encouragement for me. I hope and trust that one day my prayers will be answered for healing hearts in my family, and that I can look back and see the big picture. Thank you so much, dear Kitty! Oh, it breaks my heart to know that you are bearing this sorrow concerning hearts in your family that need to be healed. May God comfort you and send the healing for which you so fervently pray. Sending big hugs and much love to you, sweet friend. Keep encouraged! God is working, even though it may not look like it...perhaps He is now letting some necessary moves fall into place in your and your loved ones' lives. This is very timely word for me Cheryl, so many things seem to be shaking in my life right now, but I believe as I lean on God, everything will fall in place. I am encouraged Cheryl and I thank you for following God's lead to write this, and I mean it. Have a super blessed evening! Bless your dear heart, sweet friend. I know God is allowing the shaking to cause things to fall into place for you. God bless you abundantly...thank you so much for your dear visit and kind words. They truly meant so much. Sending much love to you, sweet sister! LOve the truth you have written about Cheryl. So often we are standing the hallway of life. We can see an open door but cannot see what is on the other side. Yet we know as soon as God opens it wider it's for us to walk through. We don't know how long we will have to stay in the hallway but it's good to learn to rest and enjoy it because God has things for us to learn while there. As always you have packed your post full of truth and wisdom. Blessings my sister. I loved the thoughts you shared, dear Betty. Thank you ever so much, and may the dear Lord bless you, as you so often have blessed me in so many ways. Sending much love and gratitude to you!